With the recent hikes in petrol cost lately, safe to say it's been pretty taxing on us Malaysians. We've resorted to things like switching the gears into neutral everytime we come to the slightest, shortest stop, switching to smaller cars, getting our friends to pick us up as much as possible, trying to get out of picking up our friends as much as possible, and even driving more slowly to get the most use of our petrol. As a beauty blogger and entrepreneur, I am constantly on the move. I send out parcels to the post office, I attend beauty events that are almost exclusively held in KL (mind you, I live about 30 minutes away from KL, and that's on a good day without any traffic, which is never), and I am always, always haunted by that damned petrol needle that insists on working its way down, down, down to zero at an alarmingly fast rate. Well what if I told you that you don't have to worry about traffic jams, because your car has an eco-mode that helps you switch to battery mode as often as possible, only using battery-power and reducing fuel consumption and carbon emission? More importantly, what if I told you that you would be able to preserve our environment, for our children, and our children's children? Malaysia is huge on personal cars, which means everyone owns their own vehicle, and we contribute enormously to carbon emissions and therefore pollution of our air. Enter the Honda Hybrid Jazz, a car manufactured in Malaysia (so you don't get all that nasty tax cost) with two motors - one electric, one fuel-powered. I had the opportunity to try this Honda Hybrid Jazz out and take it out for a couple of days, to see how my fuel consumption fared in a hybrid car, compared to my regular fuel-engine car. My first night with the car, I travelled everywhere - from PJ to Klang, up to Sunway, and then back down to Klang again. The next morning, it was up to PJ for a snapshot of nature - Honda really wanted us to do this and I think it really made me think about our environment, and how owning a hybrid would not only save us money in the long run, but also contribute towards the preservation of our ecosystem. I stumbled upon this review of a park in PJ called the Secret Garden, and headed over there to take a few pictures. It's always been an aim of mine to find pretty places to photograph my looks, and sadly, Malaysia has so few of these places compared to Australia. I then headed up to Kota Damansara for a meeting (where I kept the car running for two whole hours while waiting for the meeting to end), and then down to Subang Airport to pick up my trial partner - Kelly. We got lost on the way to the airport, too, and ended up circling around in the Subang New Village industrial area for like a half hour before we finally got our bearings. All through that, the petrol needle only dropped a tiny bit (and I attribute that to my boyfriend's lousy, non-fuel efficient driving i.e. speeding). So how does it work, you ask? Basically, when you're driving at low, cruise speeds (that means no acceleration), only the battery works to power your car, which means no fuel consumption, no carbon emission, and a big fat plus for the environment! When you accelerate, both engines work together, so you reduce your fuel consumption. But when you cruise at a high speed (which is what my boyfriend was doing when he drove the car in the morning on our second day), only the fuel-powered engine works, which means no more hybrid technology at work. If this worries you, fear not. 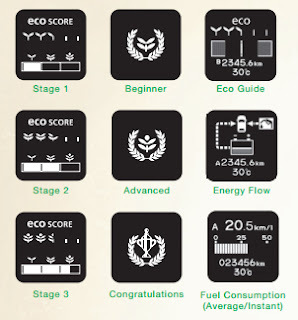 This car comes equipped with a 'Scoring Function', which tells you how fuel-efficient your driving really is. Now this function has got to be one of my favourites. I find it super useful that this car tells me how exactly I should be driving, what's infinitely more important, though, is that I can prove that my boyfriend doesn't drive to maximise fuel. HAH, take that, J!! Another thing I love about this technology? Honda have ingeniously added a way to recharge the battery in the car - by utilising the energy that is produced when the car brakes. So everytime you brake, you recharge the battery in your car a little. I seriously cannot get over how amazing this function is. GENIUS. Imagine all this bundled up into one car. A lot of people are still hesitant about hybrids, but they are honestly the best way to go to reduce the insane amount of pollution that is happening. In Malaysia, people sit in their cars for hours on end, depleting our ozone layer, contributing to global warming. If you are one of the thousands who sits in their vehicle during rush hour, braving the traffic, consider what you are doing to the environment. I understand that going home later, after rush hour, takes away from your time. So does leaving for work earlier. If you aren't willing to do that, maybe look into a hybrid that runs on battery power when your car isn't moving, therefore reducing your overall carbon emission? Honda has such faith in their hybrid technology that they are letting customers take a Honda Hybrid car home for 3 days and 2 nights. All you have to do is sign up here.